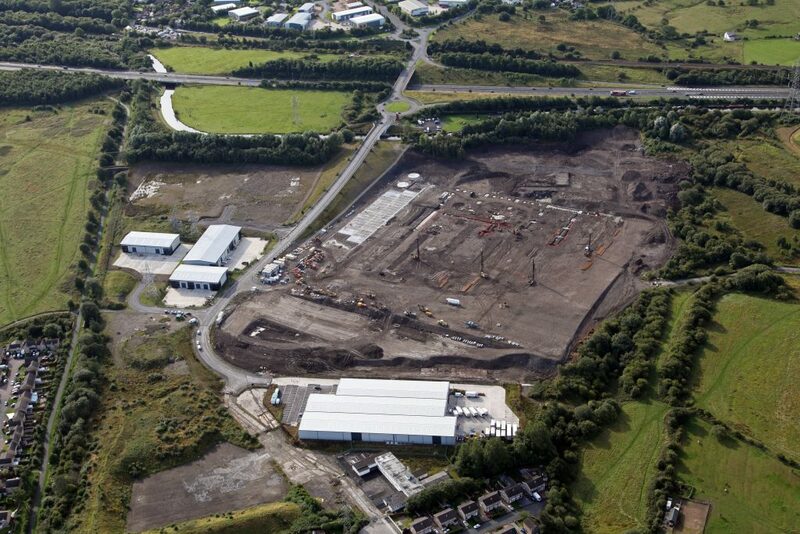 Burnley Bridge Business Park, the 70-acre employment site immediately adjacent to Junction 9 of the M65, has been launched. The business park, one of the most exciting developments in the North West, was officially opened by Burnley’s MP Gordon Birtwistle. It is estimated that 1,400 new and sustainable jobs will be created for the region once the park is full. The bridge and access road across the Leeds-Liverpool canal, which links the £50 million business park to the motorway, are now under construction and will be completed this year. This will give direct motorway access to the site, which is on the outskirts of Burnley, East Lancashire. As well as the infrastructure going in, Phase 1 will also consist of a 61,500 sq ft warehouse building is being comprehensively refurbished, providing a superb base for a logistics or industrial occupier, and 29,000 sq ft of speculative new units are being built. The warehouse is being stripped back to its steel frame and then reclad to satisfy the requirements of the 21st century. The speculative industrial units are being built in two blocks, with sizes ranging from 3,000 sq ft to 19,000 sq ft. The project has been kick-started by an ERDF grant of £3.85 million to Eshton, the developers of the site. Mr Birtwistle said: This is the culmination of some excellent private/public partnership work. I have supported Eshton, Lancashire County Council, Burnley Borough Council and the LEP to deliver this development in what we all know are difficult times. Councillor Charlie Briggs pushed the project along when he was leader of Burnley Council and the current leadership have followed through to ensure the scheme progressed. The scheme has also been given a further boost through a £2.4m loan to Eshton from Lancashire’s Growing Places Fund. The fund is used to unlock investment by triggering the delivery of projects that benefit the county’s economy. In this case, the money will be used to fund the cost of the bridge and access road. Edwin Booth, chairman of the Lancashire Enterprise Partnership (LEP), said: “We use the Growing Places Fund to make sure that high-quality development schemes with clear benefits can actually happen. Being able to combine the fund’s money with other sources of funding such as the ERDF makes it even more powerful. Mr Chapman said that there had already been a good deal of interest in Burnley Bridge from potential occupiers, thanks to its superb location by the M65 and its ability to provide bespoke deals for occupiers. “Significantly, some larger occupiers have been looking at the site and some have been enquiring about a unit in excess of 500,000 sq ft. There aren’t any other sites in the East Lancashire region where you could build something like that, especially with access straight onto the motorway network” he commented. Burnley Council Leader, Julie Cooper said: “The council is working hard to promote the borough to attract new investment and jobs. Huge investments are underway in new infrastructure, leisure and education. Burnley Council’s Chief Executive, Steve Rumbelow said: “The council has worked closely in partnership with Eshton to help secure the ERDF funding to kick start work on site, and I’m delighted work is now underway. “The site is a prime Grade ‘A’ development, which will put Burnley firmly on the ‘key regional development sites’ list used by top commercial property agents. Offering the largest commercial development opportunity along the M65 corridor, with superb motorway connections, the site is attracting a great deal of interest. The agents for Burnley Bridge are Dove Haigh Phillips of Leeds and Trevor Dawson of Blackburn and Burnley and the contractors are Eric Wright Civil Engineering Ltd of Preston.